Contains spoilers for Game of Thrones season 8, episode 1, "Winterfell"
The characters still alive for the final chapter of Game of Thrones have each gone through monumental personal evolutions. Jaime Lannister (Nikolaj Coster-Waldau) lost a hand, all three of his children, his golden locks, and a lot of dominion over Westeros throughout the series' seven seasons. Arya Stark (Maisie Williams) went from a scrappy, doe-eyed tomboy to a blind trainee at the House of Black and White to a dangerous assassin and Littlefinger-killer. Jon Snow (Kit Harington) died, came back to life, reunited with his long-lost family at Winterfell, became the King in the North, and then quickly renounced his title to bend the knee to his girlfriend… who is also his aunt. But no character has had quite as shocking a transformation as Bran Stark (Isaac Hempstead Wright), whose metamorphosis into the Three-Eyed Raven rendered him more cryptic than ever at the start of Game of Thrones season 8. A peculiar line Bran uttered during the premiere episode struck viewers as incredibly odd and has people debating its true meaning. The wheelchair-bound Stark boy tells Samwell Tarly (John Bradley) that he is "waiting for an old friend," and the final moments of the Thrones season 8 premiere seemed to confirm that the not-so-dear pal he was anticipating meeting again was none other than Jaime Lannister. As you'll recall, Jaime shoved Bran out of a Winterfell tower window when Bran caught him and Cersei in the heat of passion. When the two spotted one another from opposite ends of the Winterfell courtyard in the present, it marked the first time they had laid eyes on each other since the tragic incident that left Bran paralyzed. Despite Bran being a little — how do we put this nicely? – weird after assuming the Three-Eyed Raven mantle, it seemed he still sprinkled in some signature Stark sass in sarcastically calling Jaime an "old friend." Makes sense, right? Well, some Game of Thrones fans have a different idea about what Bran's comment truly meant. A contrasting theory regarding the "waiting for an old friend" line suggests that Bran wasn't talking about Jaime Lannister at all. Instead, Bran may have been referring to another man whom he hasn't seen in years, someone else who betrayed him and his family: Theon Greyjoy (Alfie Allen). There are three points that hold this theory up: 1) Theon's impending arrival to Winterfell; 2) his history with the Stark family; and 3) something else Bran has said that left everyone scratching their heads. First off, Theon announced during the season 8 premiere his intentions to touch down in Winterfell once more. Once he rescues his sister, Yara (Gemma Whelan), from their Jack-Sparrow-gone-wrong uncle Euron (Pilou Asbæk) and his squad of sea-faring scalawags, Theon admits to Yara that he doesn't want to go back to the Iron Islands and hold strong until winter is gone. It would be simple to wait out the war between the Night King, the White Walkers, and the humans of Westeros on a land that the monsters can't reach, but Theon has other plans: he wants to head to Winterfell, the place Theon grew up after he was taken as a ward to Ned Stark (Sean Bean) when his father failed to overthrow the Iron Throne, and fight alongside the Starks, the people he considers a second family. This brings us to Theon's ties to the Starks: an old friend of the family he definitely is. Fans know that Theon ultimately bit the hand that fed him, turning his back on Robb Stark (Richard Madden) during the War of the Five Kings and taking his father Balon Greyjoy's (Patrick Malahide) side to carry out an invasion of the North. Things were made even worse when Theon tricked the people of Winterfell into thinking he burnt Bran and his younger brother Rickon (Art Parkinson) alive after the Greyjoys seized control over the castle. Theon's betrayal sent him on a terrifying journey, which saw him become the tormented servant-slash-pet of Ramsay Bolton (Iwan Rheon) before escaping by the skin of his teeth back to safety. It's little wonder that now, after having gone through everything he did following his double-crossing of the Starks, that Theon would want to right his wrongs with the Starks and reunite with them at Winterfell — his home away from home. Speaking of home, we arrive at the third point of this theory: In the Game of Thrones season 8 trailer, Bran is heard welcoming someone back home. He states, "Everything you did brought you to where you are now. Where you belong: home." As Vanity Fair notes, it sounds like the "home" Bran speaks of is indeed Winterfell, as that's where all of the surviving Stark children are right now. While that line could be delivered to Arya or Sansa or Jon, all of whom made it back to home against all odds, those three already do belong at Winterfell and know that as fact. Even Jon, who's actually a Targaryen, feels safe at Winterfell. Theon has struggled to find his place in the world for many years, and it sure would mean a lot hear that he can call Winterfell home again — particularly from Bran. It's interesting to consider that Theon may be taking his final step toward redemption, and that his imminent meeting with Bran could be what seals the deal. Theon already has forgiveness from Jon, who told him during the season 7 finale that he is just as much as Stark as he is a Greyjoy, but receiving absolution from Bran — who remembers everything and likely forgives very little now that he's the Three-Eyed Raven — would mean that much more. On the complete flip side, maybe there's no connection between what Bran is heard saying in the Thrones season 8 trailer and the line he gave Sam. Like we mentioned before, the littlest living Stark isn't the person he used to be and has been spouting all kinds of strange stuff since he became the Three-Eyed Raven, especially since the start of the new season. Take Bran's reunion with Jon as the perfect example: When Jon hugs him and tells him he's a man now, Bran replies, "Almost." Excuse us – what? Is he just being cryptic for the sake of it? Does Bran mean he's not quite a man because he's in a wheelchair, which makes him "lesser" in the eyes of Westerosi standards? Or does he mean he's almost a man because his body is that of a grown male but his soul is something else entirely? The latter seems more likely, but in any case, there's no denying that everything that comes out of Bran's mouth can be interpreted a thousands ways to Sunday. His comment about waiting for an old friend is no exception. 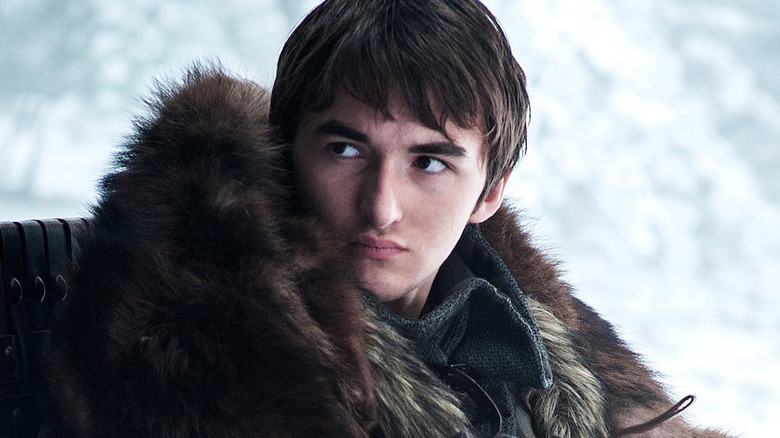 With only five episodes of Game of Thrones remaining, fans will find out the truth about Bran's cryptic line soon enough. Hopefully he won't be warged into one of Dany's dragons, spying on Jon and the Mother of Dragons locking lips, when Theon eventually rocks up to Winterfell.